Sports societies are generally considered one of the best ways to immerse yourself in university life; but how does that work for the self-proclaimed socially awkward? Netball. Fourteen girls. Two colleges. Two teams and two umpires. One of the games you think of when someone asks furiously, “What about women’s sports?” 70% a contact sport despite the rules – some of the girls in Fylde and Lonnie are so in-your-face I don’t know how some of the smaller girls haven’t exploded by now. I’ve literally seen more blood and tears in my netball career than I have in my entire life. We’ve had girls twist their ankles, girls practically take flight because they’re so eager to defend their post. Vomiting, arguments, and even injured bystanders. But I’m not here to reiterate all the details anyone who’s ever seen a match already knows, but the hidden truths about netball life. 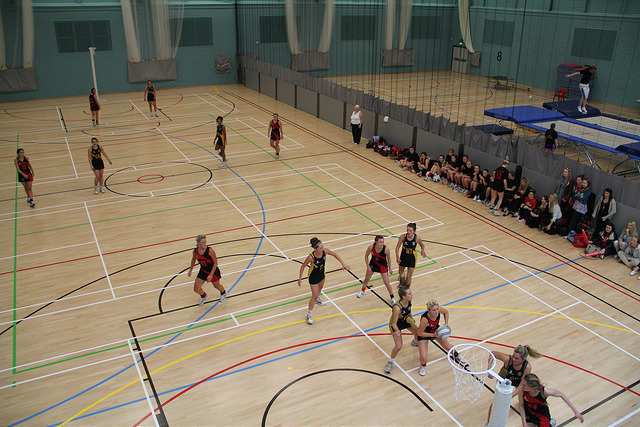 What is it actually like to be a member of a college netball club? Or more specifically, what is it like for the socially awkward? But what exactly do I mean by “socially awkward”, the words everyone uses to label anyone who “doesn’t fit in”. What I mean is the kind which sticks out like a sore thumb and will not speak unless spoken to, and even then, some of the things we come out with never seem to alleviate the sheer awkwardness of the situation. But it isn’t that we “don’t fit in” – it is never this. Not finding common ground with someone, not wishing to go out and join in the habitual drinking, does not constitute to “not fitting in”. There is no such thing, not really. It is not that we don’t fit in, more so we don’t know how to communicate with those around us. I don’t mean this in the sense that we don’t know how to respond to the simplest questions; you ask us “how are you?” and we will answer, “fine.” It is what comes after that that’s difficult. So you can imagine how the first day of netball must have been. Standing in the middle of the courts with 30-40 other girls hovering around me – and none of them are with me. But we have to make friends, is what the little voice inside our heads say. That’s the way of life. “Just be yourself,” is always the answer our mothers give us. Always the one we give ourselves. Yet those words seem to flit from our minds the moment we’re stood there in a group of people who somehow seem scarier than life’s natural disasters. Not even a simple “hello” is enough to break the ever-thickening ice wall growing between you. Or even worse: we’re completely aware that our “hellos” are not enough and all the tiniest details of our life histories come spilling out our mouths. And after all the chit chat, then comes the competition. Not the obvious “friendly” kind between colleges whereby you earn the right to laugh in one’s face by the count of a number, but the kind that categorises you. For my first year, this was most definitely the worst problem; when netball no longer stands as a sport through which you enjoy yourself, to relieve stress, and the courts look like an extra set for Mark Waters to film another scene of Mean Girls. Perhaps it was my (un)social awkwardness that made it so difficult for me to break the boundaries which divided netball. Most colleges have multiple teams based on ability. You’ll get some teams who are super amazing, super lovely. And then you have the other teams, whose cliquey politics are more complicated than some of our degrees. With them, you’re either in or out – and as a fresher, I was out. To the point where going to netball became a chore, and a method by which I habitually hurt myself and plundered my own confidence. To the point where I looked on those super amazing, super lovely teams with envy. They seemed to gel. But as a socially awkward human being, I gelled with my team as much as vinegar does on ice-cream. Passing among their friends, not allowing many of the freshers the opportunity to play more than one quarter (despite there being four to a game) – these were the issues I experienced in my own team for my first year. It sounds silly, doesn’t it? Yet this year has seen a massive improvement. While I still feel so socially awkward in some situations that I might as well have the words “socially awkward” written across my forehead, I can guarantee at least 50% of that is in my head. (Or the girls this year are so lovely that they will still sit with me through the awkwardness). As netball becomes more enjoyable, I’ve finally realised finding chemistry with every other person is not at all necessary – a nomadic sense of life, whereby you’re not attached to a particular group of friends or clique, is not frightening, and eventually, “just be yourself” won’t seem so difficult anymore.